Experience the ability to enjoy your surroundings day or night – when outdoor lighting is installed it will create another world in which to enjoy your yard after dark. Seine River Yard Care features CAST landscape lighting, and can be used to showcase the exterior of your home and/or your landscaping. Many people move inside after nightfall, but customers with lighting tend to stay in order to enjoy their surroundings. Gardens, trees, patios, water features can all be showcased as a destination. The only limitations are your imagination, and we can make your wishes into a reality. This experience can also be supplemented with outdoor speakers, in order to add to the ambience. Lighting comes with a limited lifetime warranty, and is made from quality copper & brass components. Those customers who wish to have the maintenance done can also ask Seine River Yard Care to change bulbs & service their system to keep it functioning perfectly without having to worry. 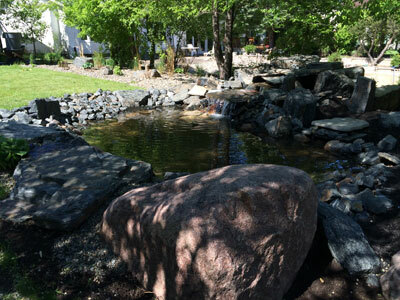 Seine River Yard Care can turn your yard into a relaxing oasis complete with waterfalls, ponds, fountains, and waterless waterfalls & fountains – delivering the calming sights & sounds of cascading water. We use quality commercial components to ensure your water features will be reliable after they are installed. The sound of water will add another relaxing dimension to any home, and we can customize it to your tastes. Type and color of rock, plants if any, urns or vase color and size are just a few of the options available to you. If you have young ones or just don’t want open water, a safe alternative is a pondless water feature. These have the sound & visual effect of water, with the water source stored out-of-sight underground. They can be large and small waterfalls or have a bubbling urn or vase, which cascade the water down the sides with different textures. No matter the size of the water feature, we can plan, design & install – just sit back and relax, your oasis is just a phone call away – contact us today.